The AIRO project team developed GIS capability using ArcGIS Viewer for Flex. 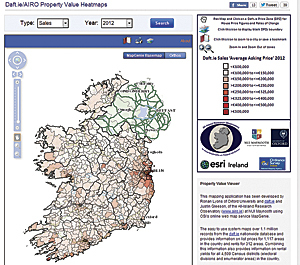 AIRO uses ArcGIS for Server to process and interpret data from Northern Ireland and the Republic of Ireland. With its ArcGIS software-enabled website, the AIRO project team has created an invaluable new decision-making tool. The All-Island Research Observatory (AIRO) is based at the National University of Ireland Maynooth (NUIM). It was set up under the guidance of the National Institute for Regional and Spatial Analysis and the National Centre for Geo-Computation. Ranking the island in terms of relative disadvantage and affluence, this maps details the social mix across Limerick City. Red areas represent some of the most disadvantaged areas on the island. Historically, there has been very little collaboration between planning departments with regard to the border in the regions. Plans are still generally made for the development of schools, hospitals, utilities, and transportation infrastructure without any consideration for community needs or other development initiatives just a few miles away over the border. All this is beginning to change. Now, there is growing appreciation—both north and south of the Irish border—of the importance of sharing information and taking into account the needs of the entire Irish population. "Roads and services don't just stop at the border," says Justin Gleeson, data and technical manager, AIRO project. "It makes sense to make decisions for the benefit of the whole island." Obviously, there are political reasons why plans were not developed collaboratively in the past. Today, however, cross-border planning is hampered not by politics but by the absence of data. Gleeson says, "The lack of comparable, cross-border data seems surprising in today's modern world, and yet it is extremely difficult to create the all-island datasets required for evidence-informed, cross-border planning." AIRO project was set up in 2008 to address this challenge and make comparable, cross-border data more readily available. The project aimed to collate and process data from both sides of the border, analyze and interpret it, and then make it accessible via the Internet. 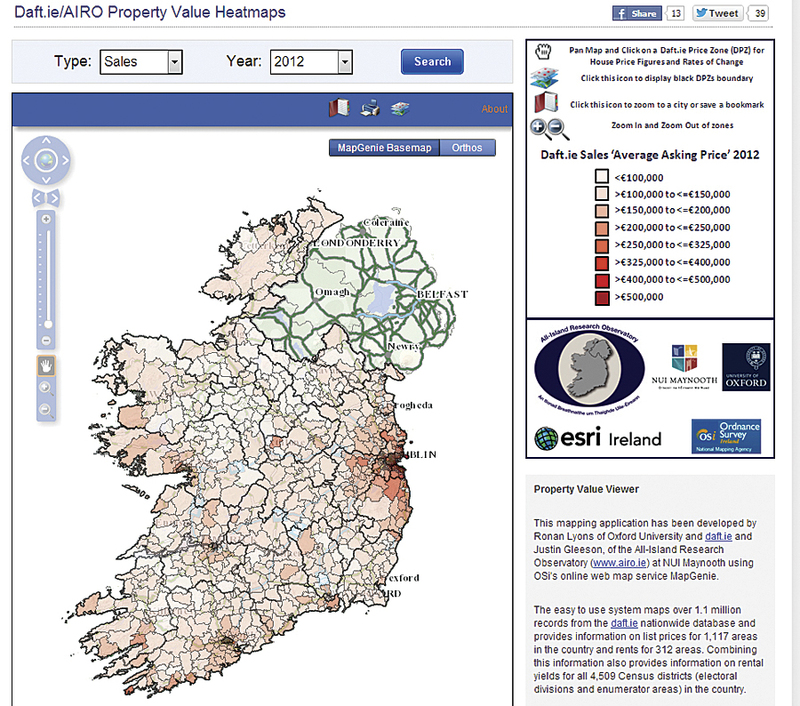 Ireland's first subcounty house price mapping toolkit tracks sales and rental changes from 2007 to 2012. From the outset, the AIRO team knew that GIS technology would play an essential role in the project. "The whole initiative centers on regional spatial data analysis, so GIS was key," Gleeson says. Specifically for the AIRO project, NUIM elected to use a number of solutions supplied and supported by Esri Ireland. The AIRO project team uses ArcGIS for Server to collate, process, analyze, and interpret relevant data from Northern Ireland and the Republic of Ireland. It performs demographic analysis and uses tools such as ArcGIS Network Analyst to examine the accessibility of public services. For example, the project team has mapped the distribution of public facilities right across the island and calculated the average drive time from every residential address point to such services. All this data analysis is then made accessible on the Internet via a series of interactive maps of the whole island. This online GIS capability was developed by the AIRO project team and Esri using ArcGIS Viewer for Flex. Planners working anywhere in Ireland can access the AIRO website, view maps of their own areas of interest, and access a wealth of statistical information to support their planning. In short, the AIRO project has helped facilitate a new era of cross-border cooperation. Although it is still early days, planners north and south of the border now have greater insight into the needs of all communities across the whole of Ireland. Consequently, they are moving toward a more collaborative approach when planning new services and facilities. "Things are going in the right direction," states Gleeson. "There is a lot of cross-border planning going on at the moment, and new joint projects are starting up all the time." 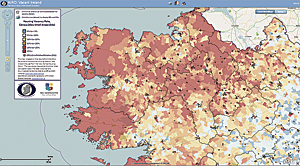 Detailing the level of housing vacancy and "Ghost Estates" across the Irish landscape with red zones representing areas with a housing vacancy rate greater than 25 percent. With the development of its ArcGIS software-enabled website, the AIRO project team has created an invaluable new decision-making tool. Public-sector planners can use it to make better planning decisions, which are backed up by accurate, statistical evidence. With more supporting data at their fingertips, planners can locate new services and facilities where they will benefit the most people. Gleeson says, "GIS plays a vital role in providing the hard evidence to inform cross-border plans." The AIRO website is already widely used and has subscribers from every government department and all local authorities across the country—north and south. On average, about 200 users access the online data every day. However, it is not only the public sector that benefits from the AIRO project. Academics and developers in the private sector can also access the online data to inform their research and development plans. "We can set up new maps in just a couple of hours and don't need heavy programming skills," says Gleeson. "It has become so easy to deliver web mapping that we are now making much more information accessible online." For more information, contact Justin Gleeson, data and technical manager, AIRO project, All-Ireland Research Observatory (tel. : 353-1-708-6157), and Joanne McLaughlin, Esri Ireland.